StopBigBrotherMD.org has discovered a marketing presentation created by ACS State and Local Solutions – the contractor for Montgomery County’s Speed Camera Program -- which included photos of drivers apparently taken from photo enforcement tickets which showed drivers engaged in embarrassing activities. These images clearly showed the drivers’ faces and engaging in “driving distractions” such as talking on cell phones, driving with “no hands” and one driver who was, yes, picking his nose. We have censored the image for the sake of our more sensitive readers and the privacy of this unsuspecting motorist. This presentation was located on the trafficsafety.org website (which is partially funded by ACS) under the file name “Burke ACS.pdf” (ACS apparently deleted this after several months when they discovered that people were viewing it from our site, but there is a copy HERE, see pg 59-60. Sorry ACS, but once its out there, its out there). The images were apparently used for marketing presentations to local governments, and since they were on the internet, were publicly viewable, exposed to search engines, and could have been reproduced anywhere without limits. 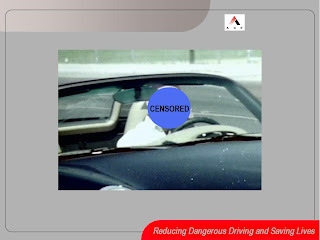 The preceding slide showing the same driver included a “Gatsometer” reading, and was clearly taken from a photo-enforcement image. Apparently ACS feels that it is acceptable to sift through red light and speed camera violations looking for the most embarrassing images they can find, and then post them to the internet for marketing purposes. In Montgomery County, currently images are taken from the rear of the vehicle, with tickets issued to the vehicle owner regardless of who is driving, but in many other locations images are taken from the front. Even from behind, it is possible to inadvertently capture things not related to the violation itself. For example, when some Montgomery County Police refused to pay speed camera citations in 2008, a member of the Montgomery County government apparently leaked to the press that speed camera images allegedly showed an officer defiantly extending their middle finger at a camera, and also the name of the officer involved, apparently with the goal of embarrassing the police union into compliance. ACS, whose business units deal with a variety of personal data, has a history of data breaches as well. In 2007, ACS had a data breach involving 2.9 million health care records including names dates of birth, and social security numbers. In 2006 another ACS breach put the personal data of 21,000 student loan borrowers were at risk. Since ACS processes the violations from the Montgomery County's speed cameras, they necessarily are given access to personal data for hundreds of thousands of drivers. We wonder what other things Montgomery County's speed camera contractor might find it acceptable to selectively reveal for non-violation-related purposes, or whether ACS has any plans to begin photo-enforcement against nose-pickers for “safety”.